I grew up in a household where lentils were commonplace. They sat in our cupboard right next to the peanut butter and corn flakes. I learned that they are versatile, high in protein, and very economical. With all they have going for them, I am bewildered that lentils have yet to gain the recognition that they deserve. So just like that aunt who can't believe a catch like you is still single, I feel it's my responsibility to be their advocate. For years, I've heard the complaint that lentils are confusing, even unapproachable. What size should I get? What color? Split or whole? Pre-soaked or no soak? It's enough to make you reach for the canned minestrone soup. But don't give up that easily. Though there are many interesting varieties, a great place to start is with the red lentil (also called "split masoor dal"). Red lentils are mild, quick-cooking, and low maintenance -- no pre-soaking required. These days, you'll even find them in regular grocery stores. Recently, I was taken aback by another charge against lentils: that they are scary. A friend of mine attempted to make lentils with a good old-fashioned pressure cooker. The problem is that for those who are not used to this cooking implement -- myself included -- it can be quite frightening, what with all its emergency valves, gaskets, whistles, and the forceful hot steam. 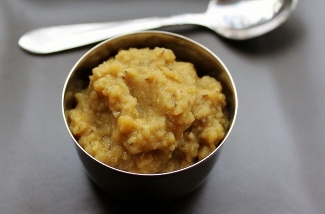 So I offered my friend the only advice I knew -- when it comes to red lentils, you can forgo your exploding pressure cooker and leave the whistling to tea kettles and Flo Rida. You can use your microwave! 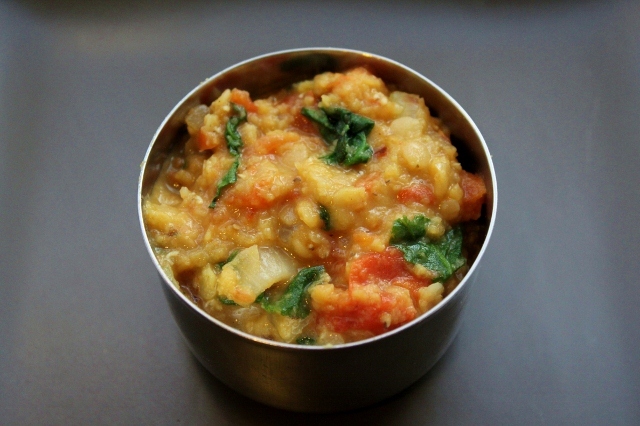 Here's a very easy way to make a hearty red lentil dish. It takes about 15 minutes, and you don't need any fancy equipment. And it's only the beginning - just like with rice or quinoa, once you have the technique down, there are many possibilities. 1. 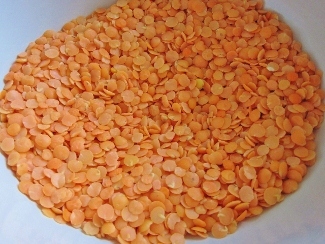 Combine the lentils with 1 1/2 cups of water in a large glass microwave-safe bowl (a 2.5 QT/2.4 L bowl is a good size). Cook on high, uncovered, for about 14 minutes. (This should be enough time under a standard setting, but you may need to adjust the recipe by a minute or two, depending on your microwave). Carefully remove the hot bowl from the microwave, stir and set aside. 2. In a small pan over medium heat, add the butter and cook for about 1 minute. Stir in the crushed red pepper flakes, ginger powder, and curry powder (if using). Let the spices simmer and infuse the melted butter for about 30 seconds. Remove from heat before the red pepper flakes burn. 3. Add the infused butter and spices, salt, and lemon juice to the cooked lentils and give it a good stir. Serve warm. You can eat this as is, with pita, or with rice. For an extra kick, add hot sauce or spicy Indian chutney and drizzle with plain yogurt. For variation, while the lentils are cooking in the microwave, sauté some onions, tomatoes, and spinach (pictured below) and simply stir them into the cooked lentils along with the spices in Step 3.